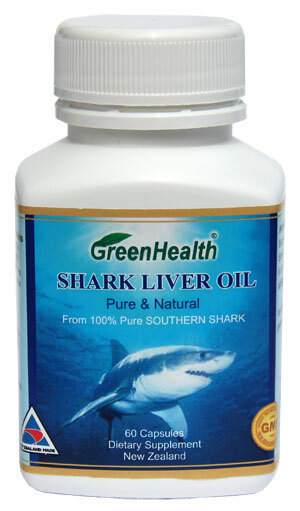 Shark Liver Oil contains alkylglycerols, chemicals found in bone marrow, liver, spleen and in mothers milk, which is involved in white blood cell production and the formation of antibodies. This product from 100% premium New Zealand deep sea shark. Take 1-2 capsules daily with benefit the cardiovascular system and overall health, or as professionally advised. Each Capsule contains not less than: Shark Liver Oil 1000mg, which contains: Alkyglycerols 200mg. No artificial flavorings, preservatives, sugar, salt, corn, yeast, gluten lactose added. Our deep-sea Shark Liver Oil is tested and guaranteed free of detectable toxic contaminants such as heavy metals (i.e. mercury, lead, cadmium, arsenic, copper, iron, etc.) and pesticides (i.e. DDT, DDE, HCB, PCB, lindane, etc.). What Is Shark Liver Oil? Oil derived from the livers of deep-water sharks shows some promise in fighting cancer and boosting the immune system. Until a decade ago, when a growing number of supplement manufacturers began to take an interest in this nutritional aid, most shark livers were routinely tossed overboard. Today, several companies harvest and process the oil from sharks caught off of Greenland, Norway, Sweden, and other coasts. The oil is available as a by-product of the commercial fishing industry; endangered sharks are not allowed to be killed solely for their oil. In centuries past, Nordic fishermen used shark liver oil as a folk remedy to heal wounds and fight the flu. Japanese seamen called it samedawa, or "cure all." Interestingly, a new use emerged in the 1950s, when a Swedish doctor noted that children with leukemia who were fed calf bone marrow showed some protection against the adverse effects of radiation. Investigation revealed that the calf marrow therapeutic actions were due to natural immune-boosting compounds called alkylglycerols, also present in notably high concentrations in shark liver oil. Alkylglycerols are naturally found in much lower levels in the bone marrow, liver, spleen, and breast milk of mature cows as well as in humans. Much of the medical interest in shark liver oil--as a potential complement to standard cancer treatments and as a natural immune booster--has focused on these promising compounds. Shark liver oil also contains squalamine, a substance which in animal studies has shown some ability to fight cancers of the breast, lung, brain, and skin (melanoma specifically) by choking off the tumor's blood supply; studies in people are under way. Shark liver oil capsules sometimes also contain generous amounts of squalene, an antioxidant and bacteria-fighter. Also present are omega-3 fatty acids (the heart-healthy oils found in other deep-water fish) and vitamin A. Shark liver oil is sometimes added to lip balms to moisturize and prevent chapping, and one recent report indicated that it might even help heal canker sores. Other than occasional patient testimonials, however, evidence is weak that shark liver oil can cure serious diseases, such as AIDS, arthritis, chronic fatigue, fibromyalgia, and psoriasis. Many points suggest that Shark Liver Oils are very useful for helping to correct Leaky Gut Syndrome and many LGS sufferers have found this to be true, especially when taken in conjunction with treatments and regimes. Most of the promising studies with shark liver oil have focused on its possible benefits against cancer and infections. Unfortunately, many of the trials have been done in animals or have been very small and inconclusive. Many researchers contend that the supplement shows real promise, however, and new, more rigorous human studies are under way. Augment traditional cancer treatments. In Europe, shark liver oil is widely used to complement traditional cancer treatments. Some preliminary research suggests that the alkylglyerols in shark liver oil may prime the immune system, causing cancer cells to come under attack and preventing spread of disease. The oil may also fortify healthy cells and ease the harsh side effects of cancer chemotherapy and radiation treatments. There are few sound studies, however, to confirm these possible cancer-fighting benefits in people. Fight infections and inflammations and heal wounds. Enthusiasts claim that by boosting the immune system, shark liver oil may protect against as well as speed the healing of colds, flu, and various minor skin infections. These types of uses were certainly common in old fishing communities familiar with sharks. Alkylglycerol-rich bone marrow soup, for example, is an old-time home remedy used to ward off colds. The liver oil also has been proposed as an immune-modulating remedy to ease asthma, arthritis, and the skin inflammations of psoriasis. Whether it is truly effective for any of these conditions remains to be proven, but for the minor ailments at least, it likely poses little risk and could possibly help.